(leading to ExpertRating Assertiveness Training Certification). Are you tired of being intimidated and treated badly by others? Discover how you lose power when you talk and how to gain it back. Find out the secrets to defusing anger and avoiding criticism. Gain the skills to be assertive with family members, friends, bosses, co-workers, professionals and clerks. It's your turn to speak out! This course includes a knowledgeable and caring instructor who will guide you through your lessons, facilitate discussions, and answer your questions. The instructor for this course will be Vivian Harte. About the ExpertRating Online Personality Development Course instructor : Vivian Harte has been teaching people how to be more assertive for more than 10 years. She teaches a "Women in Society" class for a large college, and also helps students at a major university learn how to express themselves assertively in the classroom and in the workplace. Online Personality Development Course requirements: For taking this instructor led ExpertRating Online Personality Development Course you need Internet access, e-mail, and the Microsoft Internet Explorer or Mozilla Firefox Web browser. "Bravo! I loved this course. I plan to use the many skills I have learned to help me return to the work force. After reading the section on interviews, I know I'll be confident to find a job." "Great course. I really learned a lot about myself, family and others. I learned many life lessons about becoming assertive with family, friends, and on the job. I really appreciate the information and am applying it with great success to my life. I strongly recommend this class to anyone but especially to women of all ages. It's never too late to learn new tricks." "Hi, I really enjoyed this lesson. I am an employer and I was not as assertive as I could be. This class and especially this lesson helped me to be more assertive with my employees. I have an aggressive employee who just speaks what is always on her mind without thinking. I now look her straight in the eye, relax my body pose and address the statement instead of not saying anything at all. I used to hold it in and say to myself she did not mean it that way, etc. But, I would get angry as time went on because of it and would hold a grudge. Now when I speak to her assertively, she now apologizes for her behavior and lately now she has been trying to become my closer friend. She respects me more now and actually likes when I stand up to her. It feels awesome, and I feel so much more in control. She has even given me a small office gift and card to thank me for being a great boss! Need I say more???" "I came to this class looking for ideas to help me learn how to supervise at work…I have a great assertive boss and it can be easy to push the blame onto her when I have to discipline or criticize the people I supervise. I want to stand on my own and have my own directions taken seriously, and this course has helped…Lots of helpful ideas. I have saved all of the lessons and links and I know I will be referring back to them." "I found it very interesting of what type of person I was and definitely found this course very helpful and will help me to use this information to be an assertive person." "I have enjoyed this class so much. What a wealth of information! I had a limited view as to what assertiveness is. I realize now it covers every aspect of my life. I am amazed, that in this short period of time, I have a better self-image and am feeling confident, even to the point of having been assertive about a situation at work that had bothered me for years. Having all this information, references, and different points brought out in the discussion area to review from time to time will keep me progressing. Thank you so very much, Vivian!!!" "I have learned a lot from taking this course. I find myself becoming more assertive in my daily life. Thanks to this course, I feel that I am on the way to becoming a more confident person!" "I have taken many courses and have never enjoyed a course more. Every time I would finish an assignment I couldn't wait for the next one to be released. I think more of these types of courses should be offered. You are a great teacher and your lessons are very interesting." ExpertRating is one of the world's only ISO 9001:2015 Certified companies (from TUV America) offering an Online Personality Development Course (leading to ExpertRating Personality Development Skills Certification). When you choose the ExpertRating Online Personality Development Course you can be sure that you are buying a premium International certification that is recognized by hundreds of employers and Government bodies in the US and other countries. 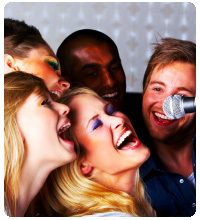 With ExpertRating you get certified quickly online and you are equipped with a store house of information through the in-depth ExpertRating Online Personality Development Courseware which has been developed by experienced Entertainment Industry Experts. The ExpertRating Assertiveness Certification is by far the best value for money instructor led Assertiveness Program at $129.99. How much does the Assertiveness Certification cost and what does it include? You can buy this ExpertRating Online Personality Development Course leading to Assertiveness certification at a special offer price of only $129.99 which includes the in-depth ExpertRating Online Personality Development Courseware and exam fee. This is the best value for money Assertiveness Program available till date. You get the following services within the USD $129.99 fee. In-depth ExpertRating Online Personality Development Courseware including scenarios and case studies. 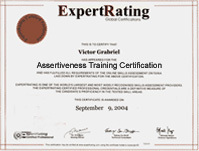 World wide airmail delivery of the hard copy Assertiveness Certificate. The Assertiveness Certificate can be used to prove your certified status and does not mention the words "online". The process of getting yourself certified is very simple. All you have to do is buy the ExpertRating Online Personality Development Course for $129.99. Log in to the instructor led course using your password. Go through the ExpertRating Online Personality Development Courseware (which would take you 6 weeks) and complete the final Assertiveness Certification exam at your convenience. You can complete the exam within 2 months of buying the Assertiveness Certification. The result of the exam appears as soon as it is completed, and your Assertiveness Certificate is mailed immediately. Chapter assignments to help you practically use the Assertiveness that you will learn during the Assertiveness Course. The final exam is fully based upon the ExpertRating Online Personality Development Courseware that is provided along with the Assertiveness Certification. If you have gone through the courseware properly you should not have a problem clearing the exam. The exam consists of multiple choice questions from all chapters of the ExpertRating Online Personality Development Courseware. Assertive people make good leaders. Being assertive is often confused with being rude or being aggressive which is not true. You can be polite yet assertive. Assertiveness means putting across your ideas and views clearly and confidently in front of others and the same time respecting viewpoints and feelings of others. Not being assertive can leave you depressed and can cause resentment. It has been observed that some of the most stressed people around are the ones who lack the skill to simply say 'no' for fear of upsetting others. You should turn down things which are immaterial to your success in the long term. It is not however, that you be assertive in every situation and with everyone. The ExpertRating Get Assertive Certification course will give you tips on how to be more confident and will improve your low self-esteem. This first lesson will mark a turning point in your life. You'll begin by measuring your assertiveness quotient, you'll learn about the many surprising consequences of not being assertive, and you'll learn to recognize the different behaviors of passive, aggressive, and assertive people. Before you can begin to act assertively, you need to be able to identify your self-canceling thoughts and change your inner script. In this lesson, you'll learn why you have negative thoughts about yourself and what those could be. This lesson will share with you several techniques for replacing them with a positive inner script, including visualization, affirmations, storytelling, writing a journal, and creating a collage. One of the ways non-assertive people lose power is through the use of certain types of language to either gain approval or avoid opposition, criticism or disagreement. In this lesson you'll learn how to recognize when you're doing this, and you'll discover some simple and painless adjustments to the way you say things that can help you avoid this problem. Now that you've learned what takes your verbal power away, it's time to learn how to be verbally assertive. In this lesson, you'll learn how to make the four types of "I" statements to tell others about yourself, respond to others' requests, ask for cooperation and support, and confront another person. You'll also learn about techniques you can use to deal assertively with people who are angry with you or criticizing you. Just as an actor perfects the nonverbal aspects of a role, you need to pay attention to the nonverbal nuances in your new assertiveness role. What you'll learn in this lesson is how to use eye contact, facial expressions, voice, body posture, gait and clothes to create an assertive image. In order for you to be most effective, you need to be able to adjust your assertive message to the personality of the person with whom you're communicating and to deal with resistance. This lesson will study four behavior types and five sensory types to help you understand which assertive approach works best. You'll also find out how to identify resistance in others by observing verbal and nonverbal clues and various methods you can use to handle the resistance you may encounter. Most people find it extremely challenging to be assertive with close family members. In this lesson, you'll learn about a variety of statements family members use to manipulate you, and you'll discover the most effective ways to respond to each of them. You'll learn how to act assertively with your parents, siblings, and children to build more positive relationships. In this lesson, you'll discover the four different emotional types of people and how they come together as mates. This lesson will explore the relationships these types have with each other, what problems tend to arise, and how the partners can treat each other differently in order to resolve any problems they may have. You'll also learn guidelines for working out issues with your partner in an assertive but loving manner. Do you find it difficult to say no to a friend who asks a favor that you don't really want to do? Do you have difficulty having conversations in social situations? If so, you'll really learn a lot from this lesson. This lesson will show you how to use the assertiveness techniques you've been learning to deal with your friends in a calm but strong manner. Next, you'll learn techniques you can use to open up to other people and carry on interesting conversations. You may approach the thought of being assertive at work with trepidation. However, when supervisors and employees treat each other with respect and act assertively with each other, both happiness on the job and productivity increase. In this lesson, you'll learn how to be assertive during job interviews as well as with your boss and subordinates, what to look for to see if your workplace encourages or discourages assertiveness, and how to advance assertiveness where you work. Often, you encounter situations in which you deal with people as a consumer. In this lesson, you'll learn how to be assertive with waiters, salespeople, government clerks, doctors, hospital employees, lawyers, and IRS agents. This lesson will also discuss how to be assertive in everyday situations, such as when a restaurant or movie theater is unbearably cold. So far in this course, you've gained a wealth of knowledge about how to be assertive. You've learned skills and techniques to use with family and friends, as a consumer, and in the workplace and everyday situations. In this closing lesson, you'll learn some situations in which it's better to not be assertive, how to give and receive compliments, and how to be assertive in all parts of your life.